Choose to Lose: The 7-Day Carb Cycle Solution is created by Chris Powell, known for his appearances on the television show “Extreme Makeover: Weight Loss Edition”. This program contradicts the information you may have heard about the need to avoid carbohydrates if you want to lose weight. With Powell’s diet you are actually encouraged to consume carbs and shown how to use them to lose weight more effectively. The basic concept of the eating plan involves cycling your intake of carbohydrates so that you have a high-carb diet one day and a low-carb day the next. This tricks your body into maximizing fat loss, boosting metabolism and preventing weight loss plateaus. On the high-carb days you must eat only high-carb meals and on the low-carb days you will stick with low-carb dishes. The only exception is breakfast, which is always high-carb to ensure you get a great start each day. On average, for effective weight loss, women will consume about 1200 calories on the low-carb days and 1500 calories on the high-carb days. Men should have about 1500 calories on low-carb days and 2000 on the high-carb days. Each day with Choose to Lose you will consume five small meals, spaced about three hours apart. Additionally dieters are advised to drink a gallon of water each day. If you like you can take a day off your diet on Sunday and eat anything you want for the entire day. Powell says this approach actually tends to produce the best results. Alternatively you may eat one cheat meal on each high carb day. Although Choose to Lose reduces the chances of experiencing a diet plateau, it may eventually occur, so the book includes an additional technique designed to help you break any periods when your weight loss stops or slows down dramatically. Chris Powell offers tips for dealing with triggers such as going to a restaurant or the movies, social gatherings and eating in the workplace. Also provided are guidelines for meal planning, recipes and a maintenance plan. Egg whites, tuna, lean beef, turkey, chicken breast, nonfat Greek yogurt, low-fat cheese, protein powder, natural peanut butter, almond milk, whole grain bread, oatmeal, granola, brown rice, potatoes, berries, banana, tomato, onion, mushrooms, spinach, green beans, celery, avocado, salsa, Mrs. Dash seasoning, stevia, coffee, tea. The following is an example of a Choose to Lose low-carb day. Choose to Lose: The 7-Day Carb Cycle Solution asks that six days a week you perform a thirty-minute “shredder” workout involving cardiovascular interval training, where you switch between low, moderate and high intensity aerobic exercise. And on your low-carb days you will do a ten-minute “shaper” workout, which involves muscle -toning exercises. There is an iPhone app from Chris Powell. 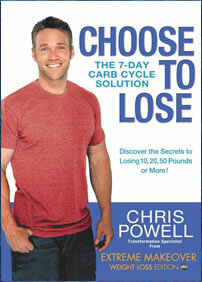 Choose to Lose: The 7-Day Carb Cycle Solution retails at $24.99. No need to completely eliminate any foods. Cycling carbohydrates and calories keeps the metabolism high. Low risk of dietary boredom. Choose to Lose includes inspirational weight loss stories. Necessary to monitor portion sizes. Some dieters may regain weight when they stop cycling carbs. Not suitable for dieters who prefer not to follow a structured meal plan. There is a potential for an excessive intake of calories on “cheat days”. Carbohydrate and calorie cycling diets, such as the one outlined in Choose to Lose: The 7-Day Carb Cycle Solution, tend to produce relatively fast and effective weight loss, while boosting the metabolism for long-term results. Choose to Lose involves a fairly regimented diet plan, however the inclusion of cheat meals and the alternating carbohydrate allowance, may make it easier for many dieters to stick with the program, thus enhancing the likelihood of successful outcomes.